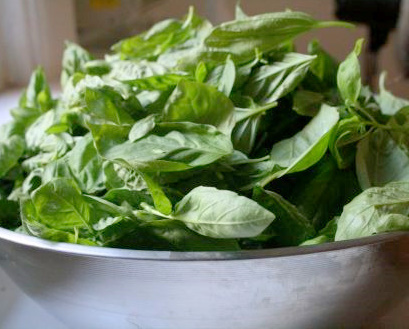 If you planted basil last spring, you’ve probably been using the fresh leaves all along, to add a little zest to salad, tomato dishes, and pasta. Since the plant is an annual, however, it will only be with you until first frost — so now is the time to preserve those flavorful leaves by making and freezing pesto. 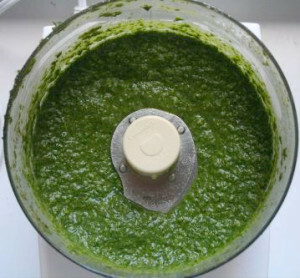 Pesto is a zesty, fragrant sauce made of basil leaves, grated Parmesan, pine nuts, garlic, olive oil, and salt and pepper. It can be served over pasta, added to soups, or used as a spread in sandwiches. You’ll never find two recipes that call for the exact same proportions of the ingredients, so experiment until you find the right flavor for you. Put basil and garlic in the bowl of the food processor. As it runs, slowly drizzle in olive oil till the mixture is pureed. Add pine nuts and Parmesan, and process to mix. If too thick, add more oil or a tablespoon of water. Season with salt and pepper to taste. During the summer months, you can make pesto for a fraction of what it costs to buy it in the winter. Fortunately, it freezes easily in bags (lay them flat and stack them to save space) or in plastic containers.